John Cork gained prominence in the film industry as the writer of the acclaimed Civil Rights drama, The Long Walk Home, starring Academy Award-winning actresses Sissy Spacek and Whoopi Goldberg. He has since written for most of the major studios. In 1999, Cork formed Cloverland, a full-service film and video production company. Through Cloverland, Cork has produced and directed hundreds of documentaries and featurettes, from feature-length works (Carmen Miranda: That Girl From Rio; Murnau, Borzage and Fox [co-directed with Lisa van Eyssen]) to short documentaries on filmmakers, films, history and the lives and works of famed authors such as Ernest Hemingway, Leo Tolstoy, Ian Fleming, John Fowles and P. G. Wodehouse. In addition, Cork has co-authored three books on the history and impact of the James Bond novels and films: James Bond, The Legacy (with Bruce Scivally); Bond Girls Are Forever (with Maryam d’Abo); and The James Bond Encyclopedia (with Collin Stutz). Cork has written for such publications as Variety, Hollywood Reporter, Esquire UK, Hemispheres, High Life, Bookseller, Sainsbury’s magazine and numerous newspapers. 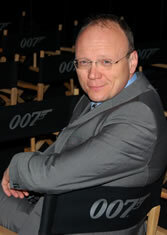 Cork is a respected film historian and an expert on the James Bond phenomenon. He has been interviewed by national news outlets including CNN, BBC, FOX, NPR, CNNfn, ABC, The New York Times, The Los Angeles Times, The Wall Street Journal and many other media outlets. Cork lives in Los Angeles with his wife, singer Nicole Dillenberg, and their son. Over the last eleven years, Lisa van Eyssen has built a strong background in non-fiction film. Born and raised in Los Angeles, California, Lisa spent a decade in England, studying and working in theater and film before returning to Hollywood in 1998. While at Van Ness Films & Prometheus Entertainment, Van Eyssen produced a wide range of projects for The History Channel, AMC and BRAVO, as well as writing and producing biographies for A&E. After working with Automat and Leva Filmworks, Van Eyssen joined Cloverland in 2006, and since has served as a producer, writer and director on over 50 projects.